Counts of seabirds passing east or west along the Waterford coastline have been made from various headlands since the 1970s, mainly Brownstown Head in the east and Helvick Head in the west. Counts and range of species tend to be highest from spring through to early autumn, but seawatching at any time of year can be worthwhile. 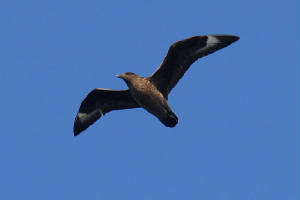 Conditions with strong onshore winds - especially from south-east, south or south-west at Brownstown, or south to south-west at Helvick - or with reduced visibility can be especially productive and may include a range of scarcer specis such as skuas. 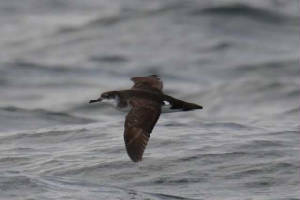 But large movements or inshore feeding flocks of Manx Shearwaters can also occur in calm, clear conditions. See seawatch summaries 2012 & seawatch summaries 2011 for details of watches at local headlands. Building on the weather-dependent seawatches usually undertaken at Irish headlands, 'Seatrack' is a new seabird passage monitoring initiative run by BirdWatch Ireland in conjunction with BirdLife International partners in the UK, France, Spain & Portugal focusing on the distribution & status of Balearic Shearwaters during the non-breeding season. Starting from July/August 2010, the project will involve the co-ordination of simultaneous seawatch sessions from different headlands across the entire country on selected target weekends between late summer & autumn. Click here for further details. The Seatrack project initially involves 'dedicated watches' every second weekend from mid July to early November, generally for 3 hours starting about an hour after dawn. This applies regardless of weather, as counts during 'average' conditions are being collected. 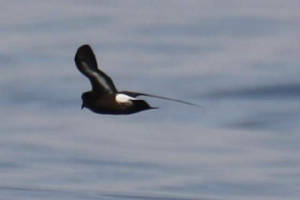 The main target species, in addition to Balearic Shearwater, are other shearwaters, storm-petrels, divers and Common Scoter, but a wider range of species if possible. 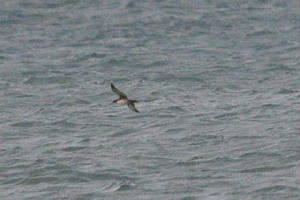 In addition, a 'random records' form is being used to collect details of any other seawatching records, e.g. from shorter or opportunistic seawatches. 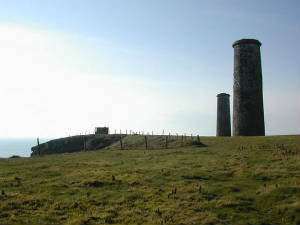 So far, a range of sites nationally are signed up for the project, including Brownstown Head in Co Waterford. If anyone is interested in helping with coverage of Waterford sites, please send an email to seawatching @ waterfordbirds.com or to the national Seatrack organiser to find out more. Some preliminary results are downloadable below for Waterford sites in 2010 (highlights or higher counts also summarized on Recent Reports page and see also 2011 summaries). The map below shows most of the regular Waterford and Irish seawatch points, or other sites that regularly produce sightings of Balearic Shearwater. Key to site-names (clockwise from SE Wexford): Greenore Point (GREEN), Carnsore Point (CARNS), Hook Head (HOOK), Brownstown Head (BROWN), Ballinclamper (BALLI), Helvick Head (HELVI), Mine Head (MINE), Ram Head (RAM), Ballycotton (BALLC), Old Head of Kinsale (OHK), Galley Head (GALLE), Toe Head (TOE), Cape Clear Island (CAPE), Mizen Head (MIZEN), Dursey Island (DURSE), Brandon Point (BRAND), Bridges of Ross (BRIDG), Silver Strand (SILVE), Baile na hAbhainn (BAILE), Slyne Head (SLYNE), Annagh Head (ANNAGH), Downpatrick Head (DOWNP), Killcummin Head (KILCU), Rocky Point (ROCKY), Melmore Head (MELMO), Fanad Head (FANAD), Ramore Head (RAMOR), St John's Point (STJOH), Skerries (SKERR), Dalkey (DALKE), Balbriggan (BALBR), Wicklow Head (WICKL).